Property experts in India are suggesting that this is the best time to invest in the properties. Especially, returns are expected to be great on the residential properties. They have also suggested that tier 2 cities in Lucknow have better chances to produce more returns for the investors in the long run. Upcoming years will be great for this city as advancement is now the major component of this city and people in large numbers are favouring this city for a sophisticated and luxurious lifestyle. Mainly because of the commercialization, Lucknow city has made its unique identity and is the biggest reason for which people are moving towards it. From the past few decades, there are hardly any slumps or downfalls recorded here for the sale figures in the residential sector which is why developers are continuously been involved here in the constructions. As demands are rising here continuously, they did not face any major issues in selling their units and are earning more and more profits here. For buyers too, projects in Lucknow brings several advantages. Located strategically, most of the projects are in proximity to the major working destinations in the city and due to the excellent network of wide and express roads, Lucknow city provides excellent connectivity to its residents. Moreover, if you choose any of the luxurious projects in this city wisely by considering some prime factors, you supposed to avail several additional features, specifications, comforts and luxuries there. If you are searching brilliantly constructed luxury homes in Lucknow and with the most comparative prices, you should choose the ultra-luxury apartments in Antriksh Abril Green. The development is tremendously designed with unique architectural designs and the latest tools and technologies used here in the construction have provided a classy touch to this property. Made for those, who love the extra comforts and best luxuries, Antriksh Abril Green Lucknow is offering several top-notch specifications and features to its buyers. The project will release possession for its 2 and 3 BHKs in December 2021 and with the current Antriksh Abril Green price, there is a very strong possibility that you can make huge returns from it during the time of possession while reselling the property. These living spaces are undoubtedly antiques and available in the sizes range from Rs. 33.99 lakhs to Rs. 52.17 lakhs. One of the major advantages to choose Antriksh Abril Green Vrindavan Yojna is its wonderful location which provides seamless connectivity to the residents. It is easily accessible to the airport, major commercial destinations and all the renowned landmarks in the city. All other transportation sources in the city are also very well-connected to the development. You will never say no to this property after viewing the extraordinary amenity section here. Some major features of this special section here contain a sewage treatment plant, rainwater harvesting, Wi-Fi connectivity, swimming pool, restaurant, clubhouse, meditation centre, indoor and outdoor games facilities, ultra-modern gym and a lot more. 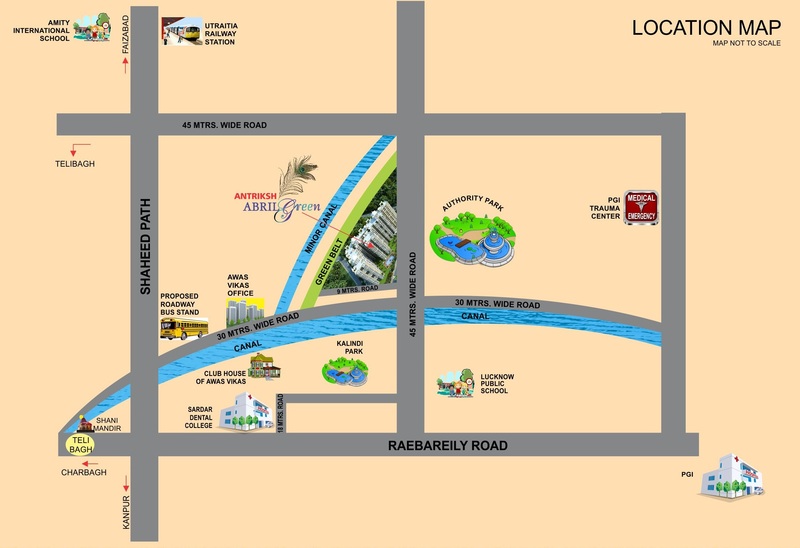 This project remarks as the true addresses for ultimate luxury buyers of Lucknow.